K-ON posesses a style of comedy that is very similar to Hyakko or Azumanga Diaoh, which is random and outrageous. 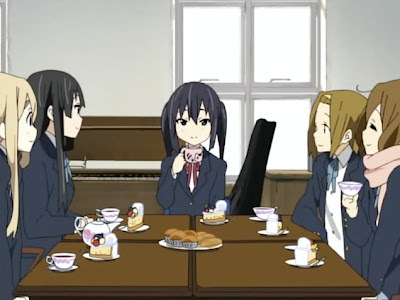 But unlike Hyakko or Azumanga Diaoh, the story of K-ON actually has a continuous and semi-organized flow which makes it much more interesting to follow. In my opinion, this is not only the best comedy anime from the April new anime season, it's by far the best comedy anime of the year so far. I really wish they would make a sequel to this. Recommendation: No doubt this is one of the MUST-WATCH anime of the year. It should be on everybody's to-watch list.